In my mind, every good southern meal should either have biscuits or cornbread. Christy Jordan included her dad's recipe for biscuits so I chose to make them as part of our meal. I have a favorite biscuit recipe so it is hard for me to try a different one. I'm glad I did. This is made differently than I am sued to which made it a lot of fun to prepare. It seems most biscuit recipes call for very cold butter. This one uses a softened butter which made it very easy to incorporate the flour into it. For those of you who missed yesterday's post, MiMi made a family dinner completely from one of her favorite cookbooks. Every part of the meal came from the following book. MiMi loves the book and highly recommends it! Preheat the oven to 450 F and grease a baking sheet. In a large bowl, cut butter into flour with a fork until mixture is crumbly. Cover and chill for about 10 minutes. Stir in cold buttermilk until just incorporated. Turn the dough onto a floured surface and knead until it starts to come together, adding a little bit of flour if necessary to keep it from sticking. Pat dough into a rectangle about 1/4" thick. Fold in thirds, like you are folding a letter. Pat back out into a 1/4" thick rectangle. Fold and pat two more times. The last time, keep the dough 1/2" thick. Dip your biscuit cutter in flour and cut the biscuits. Place them on the prepared baking sheet with their sides touching. Bake for 12-15 minutes, until lightly browned. Brush the tops with butter and enjoy! 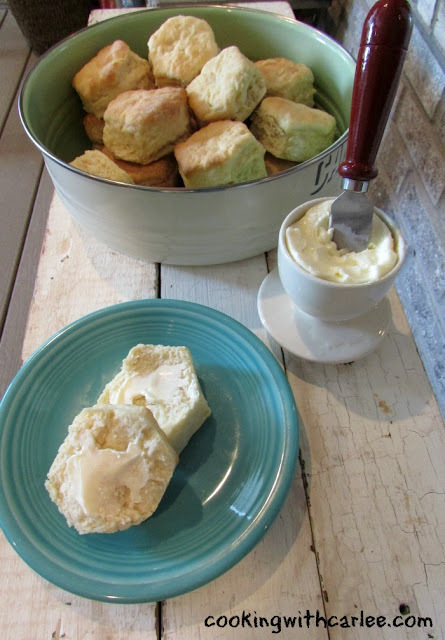 My husband would love it if I made some homemade biscuits!! Biscuits are like pie crust, really pretty simple but still intimidating! Carlee, they do look delish!! Happy Memorial day weekend to you and yours! Aren't they pretty biscuits? Have a great weekend, Mollie! Oh my, just look at that pan of awesome biscuits, wish I had 1 or maybe 2! Thanks so much for sharing with Full Plate Thursday and have a great weekend! Aren't fresh biscuits the best?! Thanks, Miz Helen! There's nothing better than a great biscuit recipe! And the fact that you can use softened butter with this one, priceless. A biscuit can make for a great breakfast, lunch or dinner! Thanks for sharing this, I've pinned, yummed and stumbled, I don't want to lose this recipe! Thanks so much, Nikki! 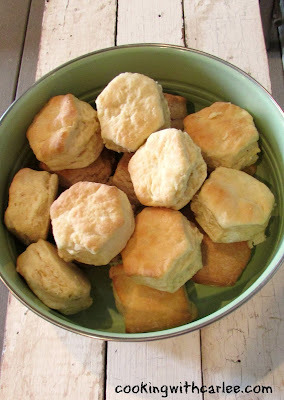 I love a good biscuit and they are so versatile too. Mmm!